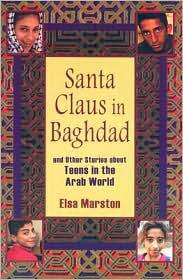 This collection of eight short stories profile a different young person in a different Middle Eastern country, focusing predominantly on areas which have been beset by violence (Iraq, Lebanon, Syria, etc.). While some of the struggles are familiar YA themes, the setting i scertainly not. So, like last year's In the Name of God, Marston illustrates both what is similiar and what is different. Marston is a bit overly conscious of her role as an introducer of a culture to the West and some of the stories can get preachy (and politically slanted as well). Moreover, as a collection of stories, there is a wide variety of strength in the work. The first story (which lends its title to the book) is a particularly beautiful retelling of O Henry's Gift of the Magi and is one of the most haunting stories in the collection. Other stories, like "The Olive Grove" (about the Intifada) or "Honor" (about honor killing in Syria), falter under the weight of their political agendas. Politics of course has its place (and novels like the aforementioned In the Name of God or the haunting Tasting the Sky have successfully melded politics and teen angst) but Marston is at her best when she keeps her focus on the kids. And Marston does succeed at times. "In Line" manages to tell a story about friendship while still highlighting class tensions in modern Egypt.